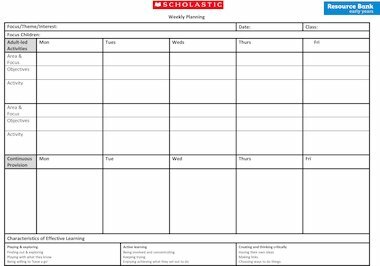 The first of our weekly planning templates focuses on the week as a whole, organising planning day-by-day. There is space for two adult-led activities per day as well as continuous provision. The objectives should be based on the Development Matters while the characteristics of effective learning can be highlighted where there is a focus on specific aspects. Space is provided to record any focus children for the week. For more detailed planning templates please see our adult-led, continuous provision and adult interaction specific templates.